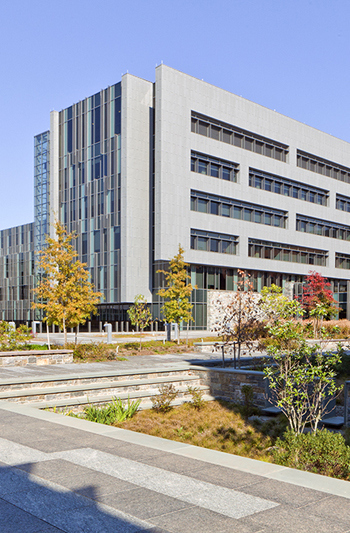 The General Services Administration (GSA) granted us a rare look at a Level 5 security campus, the new U.S. Coast Guard Headquarters, at the restored St. Elizabeth's Hospital in southeast Washington, D.C. This $646-million project is just the first in a series that will transform a mid-19th-century mental asylum, founded by social reformer Dorothea Dix, into the new headquarters for the Department of Homeland Security, of which the Coast Guard is a major piece. 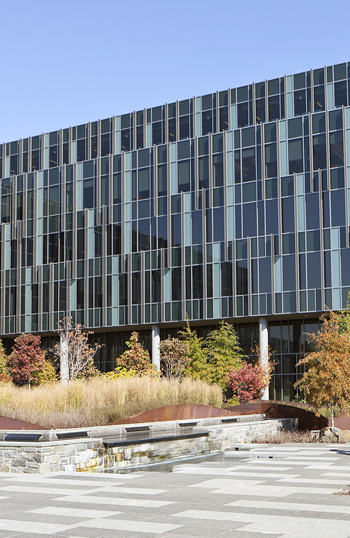 In a tour, Christian Gabriel, ASLA, national design director for landscape architecture at GSA, said "the goal of the new facility is improve operational efficiency by bringing together all the Homeland Security leadership in one place." Leaders of the department will occupy revamped asylum buildings that once housed patients like Modernist poet Ezra Pound. The tour started with moving through multiple high-security checkpoints stacked with fully-armed guards. Once cleared, we looped up towards the upper terraces of the new 1.2-million-square-feet Coast Guard headquarters, designed by architects at Perkins + Will and landscape architects with Andropogon Associates, with HOK providing landscape architecture, interiors, and sustainability services as part of a design-build team. As Gabriel explained, new Environmental Protection Agency (EPA) rules meant that 95 percent of stormwater had to be captured on site. On top of that, historic preservation, sight, and security considerations meant that the new Coast Guard headquarters needed to be lower than the historic asylum buildings. 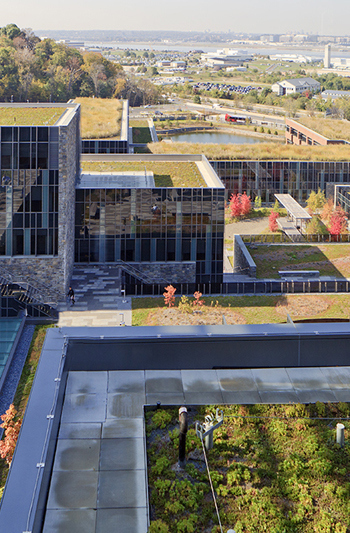 What that meant in reality -- for such a large site on such a steep slope -- was GSA needed to set the 9-story building deep in the hill and cover it in a set of stair-step green roof terraces that funnel water down to a constructed wetland and pond. 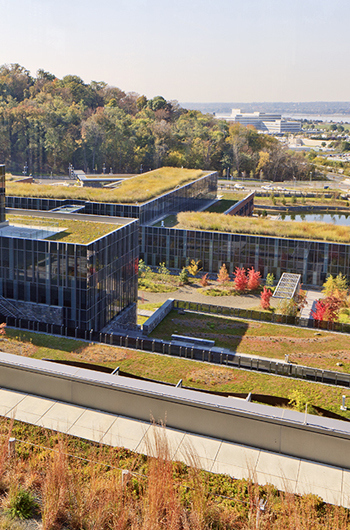 GSA ended up creating the second largest green roof in the U.S. at 550,000 square feet, and the third largest in the world. It's so big that a deer actually grazed on the roof, not realizing it was on one. 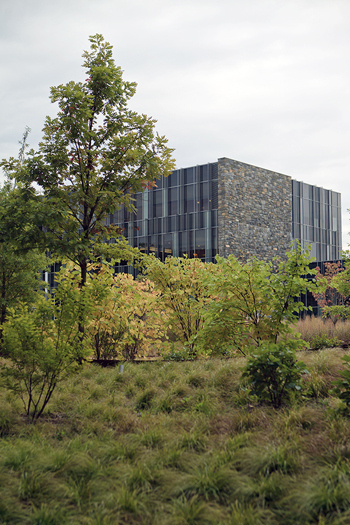 Thomas Amoroso, ASLA, the landscape architect who designed the project at Andropogon, explained that while the system may look complex, it's actually pretty simple. "It's low-tech and common sense. The green roof terraces are a gravity-based system that move water from the higher terraces to a lower ones and then into the pond." That the system operates in such a seamless way -- and also doubles as public space for the coast guard officers operating the facility -- is a testament to the depth of the design. 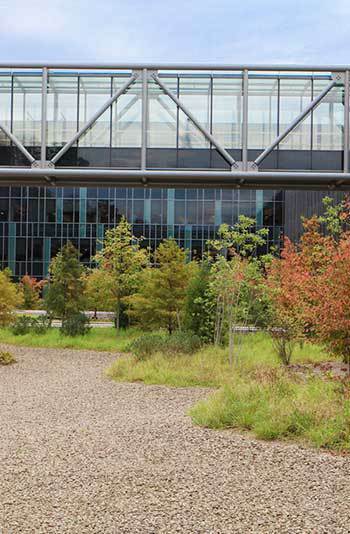 As we make our way down through many floors to get to the 350,000-cubic-foot pond, we begin to see subtle differences in the plant life in the courtyards spread among the green roofs. Amoroso, and HOK landscape architect Brandon Hartz, ASLA, explained how they "replicated existing native eco-zones throughout the courtyards." During the 120-foot-drop through the levels, water moves off the buildings, onto roofs and courtyards, through diverse regions, from the "Blue Ridge and rocky barrens of Piedmont to the coastal plains." All the courtyards that get ample light feature a mix of shrubs, grasses, and Oak community trees, a majority of which are native. "They are habitat for wildlife." Indeed, Hartz told us how there are actually gravel pockets in the roof designed to enable nesting by Killdeer, a small bird. And a rare bald eagle and its family now live on the facility, too. Once the water leaves these upper courtyards, it makes it way to the lowest courtyard -- the vernal pool, where the wetlands cleanse it. 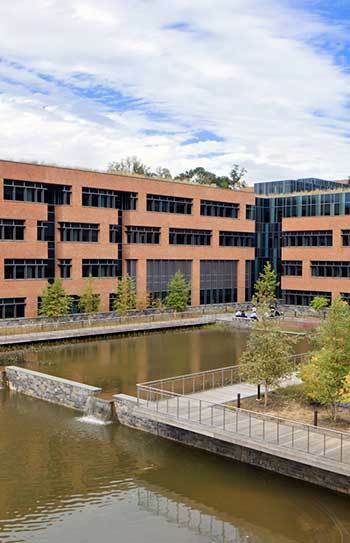 Then, stormwater is conveyed to the huge constructed pond, where it's aerated, recycled, and used to water the green roofs and courtyards once again. While we saw few people outside when we visited, Amoroso said many thousand Coast Guard officers are already hard at work there, with a few thousand more scheduled to move in. We saw a few officers pulling together cafe chairs and table together for an outdoor lunch. Hopefully, the Coast Guard will put some effort into organizing outdoor events, so they can better take advantage of their landscape. While some may balk at the $646 million price tag, imagine the cost if the GSA had used grey instead of green infrastructure to deal with all that stormwater. For this alone, the design approach seems like a wise use of taxpayer money. 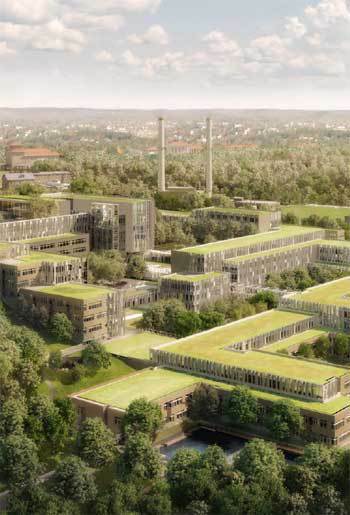 And it's good news that the biggest government construction project since the Pentagon is covered in green roofs; it would be upsetting if it wasn't. It's just too bad that the security is so high that more people can't get in there to see it for themselves.